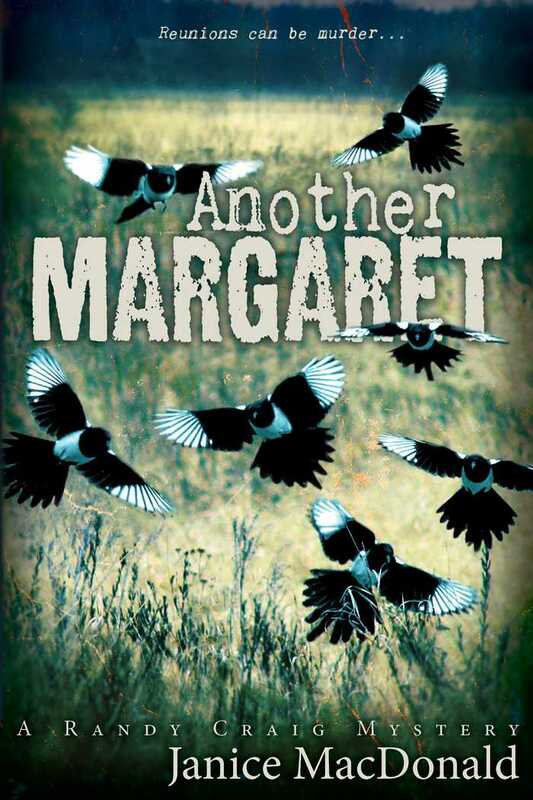 Book Review: Another Margaret by Janice MacDonald—and a Giveaway! Anxiety is the watchword at most school reunions, with side-eye comparisons of greying hair and extra pounds around the belly. Not our Randy Craig. She’s more concerned with resolving a 20 year old CanLit scandal and catching a ruthless killer. While helping her best friend Denise organize their 20 year reunion at the University of Alberta, Randy’s tumultuous past as a graduate student comes rushing into the present as she faces off against old ghosts and imminent death. Another Margaret is both Janice MacDonald’s first and sixth installment in her wildly popular Randy Craig series set in Edmonton, Alberta. Embedded in this latest adventure is Janice MacDonald’s very first, now out of print, Randy Craig mystery. less golden than the last time we had seen each other. I really love that thought, partly because it so accurately describes my feelings towards my upcoming high school reunion, but it also sets the tone for this appealing academic mystery. I knew then that I could expect more than a dash of dry humor mixed in with what I hoped would be an interesting puzzle and that’s exactly what I got, I’m happy to say. Randy Craig is new to me and I found her quite appealing. She’s smart without being overbearing about it, has a sense of humor, isn’t entirely sure what she wants to be when she grows up and has an ingrained sense of loyalty to her friends. She’s also snoopy as any good amateur sleuth should be and she’s not young and fabulously beautiful. In short, she’s my kind of woman and comes across as entirely believable. Edmonton turned out to be an engaging setting for me as did the university, the latter because of both its similarities to American universities and its differences. Edmonton is pictured as a metropolitan area with a small town feel and that’s very much like my own city, Richmond, VA. I could almost have been reading a book set here and that was really nice. I think I’d like to visit the real Edmonton some day. Most of us have at least one favorite author who has passed on and we can’t help wishing there could be at least one more book, a manuscript the author had squirreled away, and Randy can’t believe her beloved Margaret Ahlers did just that. In fact, she really can’t believe it and she has every reason to doubt the story since she had thoroughly researched the author for her thesis. Surely it isn’t possible that she completely missed this little tidbit of information and, if ever a person had a reason to investigate, this is it. Unfortunately, Randy doesn’t foresee what her probing is going to bring to light. I haven’t “met” Randy Craig before and, while I have no problem reading a series out of order, those who do should not hesitate to pick up Another Margaret. For a variety of reasons, Ms. MacDonald has written the core of her first book into this one so the reader is literally getting that one along with Randy’s newest adventure. It’s the perfect way to become acquainted with a series, one that I can heartily recommend. October 2nd, after Janice’s guest post. the evening of Monday, October 5th. This entry was posted in Contests/Giveaways, Full Reviews, My Reviews and tagged academic, Canada, college reunion, Edmonton Alberta, mystery, Ravenstone. Bookmark the permalink. This book sounds like something I would really enjoy. It’s been a while since I have read a book set in academia. Also, I’m curious how the author manages to write the first book in the series into this one. Like going to Grad school with Jessica Fletcher, that sold me, sounds like a wonderful mix of characters and a mystery unraveling, always enjoyable! Some of the above comments are great, especially academia, and often authors can reiterate from one book to the next, important events that occur: Michael Connelly, for one as well as Sue Grafton. I usually like to read books in a series in order but it sounds like that won’t be a problem with this one! This sounds like a book I would enjoy! This captivating novel interests me greatly since I am Canadian, have been to Edmonton, many years ago and would find this book enthralling and unique. Your excellent review gave me insight into the author, her writing and books. Thanks for this great feature and wonderful giveaway. Just returned from a high school reunion so this book sounds really enjoyable – no killer loose as far as we know. What an intriguing and fascinating mystery with an unusual setting and an author who is talented and creative. I would love to read Another Margaret and thanks for introducing me to this author and her great books. Another new-to-me author to try. Sounds like a mystery that I would like. Thanks for a chance to win a copy. Your review peeked my interest in this series so I would like to receive to read and review. Not on line yesterday so appears I have posted in reverse order. Looking forward to a new to me series. Humor along with mystery is my kind of book. thanks for the review! This book seems like one I would love to read. I have not read Janice’ books before now so would like to try this one. Yikes, this book and giveaway have gathered a great deal of attention.